03:00 p.m.(April to September) 02:30 p.m.(October to March) - 07:00pm / 06:30p.m. This tour will drive you along the impressing coastal road which connects Athens and Cape Sounion. The route offers a stunning view to the Saronic Gulf, passing through the classy suburbs of Athens, Glyfada,Vouliagmeni and Varkiza. 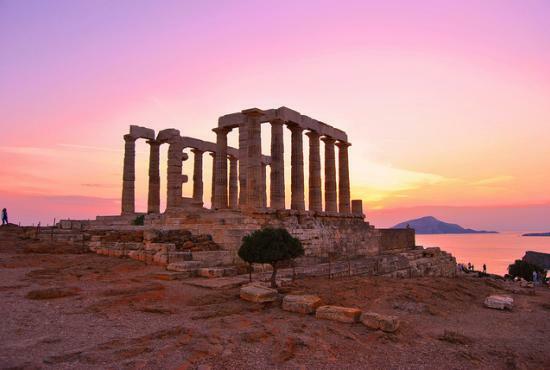 Once in Sounion you will visit the Temple of Poseidon , God of Sea, which was constructed during the 5th century B.C. . The remains are perched on the edge of a rocky cape imposed on the sea. This point overlooks the Aegean offering one of the most breathtaking panoramic views in Greece. The myth has it that this is the place where King Aegeus, anxiously looking out, despaired when he saw a black sail on his son’s ship, returning from Crete and leapt to his death off the cliff, thus giving his name to the Sea (Aegean). On a clear day you will be able to view from a distance 6-7 islands.